Chicken Parmesan has all the makings of a perfect meal -- fried meat, cheese, and sauce -- but all too often the execution falls flat. Once you smother the cutlet in melted cheese and hot marinara, you've got a mere minute and a half before it starts getting soggy. After that, what's the point? 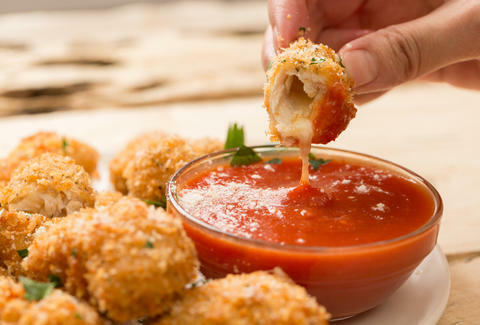 These ultra-crispy chicken Parmesan nuggets put the cheese on the inside and the sauce on the side so they stay ultra crispy until the last bite, like all fried things should. 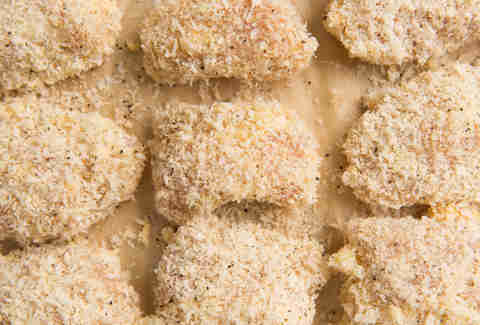 In a large bowl, combine bread crumbs, Parmesan, garlic powder, salt, pepper, and paprika. Set aside. Cut each chicken tender crosswise in half. Using a paring knife, cut a pocket into each piece lengthwise. Gently insert a finger into the pocket to expand it without tearing it. 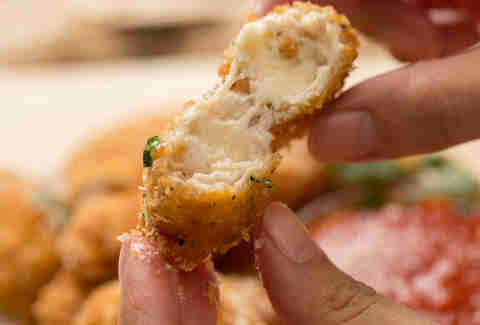 Push a stick of mozzarella into the pocket until it's completely enclosed with chicken. Repeat until all nuggets are stuffed. Season nuggets with more salt and ground black pepper. Dredge each piece in flour and tap off excess, then dip in egg, then dredge in bread crumb mixture. In a deep fryer or heavy-bottomed pan, heat oil over high heat until almost smoking. Add chicken nuggets, 6 at a time, and cook until golden brown, about 3 minutes per side. Transfer to a paper towel-lined plate. Heat tomato sauce in a medium saucepan until simmering. Garnish nuggets with parsley and Parmesan. Serve with sauce on the side for dipping.